Whisk the eggs and sugar in machine until very thick. Sift the flour and cocoa together and fold into the egg mix-gently but enough to mix in all the dry ingredients. Add in the hot water and stir through. Spread between 2 trays and bake at 170 0C for 8-10 mins. Lay out 2 sheets of paper and dust with some of the extra cocoa powder. Turn out the sponges onto these sheets. Leave to cool, then remove baking paper and cut into 18x7cm circles. Dust with more of the extra cocoa powder and set aside. Melt the chocolate with the the milk, stir until really smooth. Cool slightly. Fold in the orange zest. Semi whip the cream and fold into the chocolate cream. Set aside. Line flat trays with baking paper. Place metal rings on the trays. Cut strips of paper to fit the rings (25cm x 7cm) and line each ring. When set, cover the top piece of sponge with a tablespoon of the chocolate sauce. Sprinkle with the roughly crushed macadamias. Return to the fridge to set for 10 mins. Copyright Duck Creek Macadamias, 2012. All Rights Reserved. For the chocolate connoisseur looking for that something special to ‘hit the spot’, look no further. Award-winning Duck Creek Macadamia’s have again cracked the nut with their NEW couverture chocolate indulgence which will leave you orange with obsession. 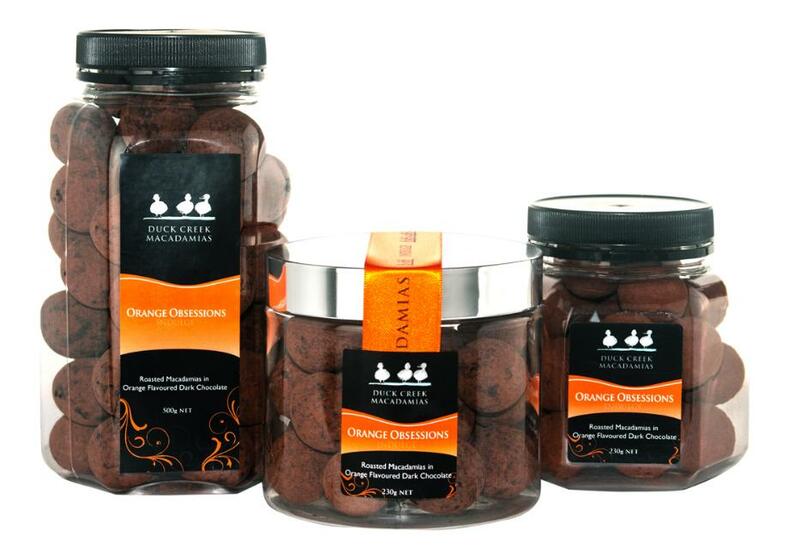 Duck Creek’s ‘Orange Obsessions’ are premium roasted macadamias panned in orange flavoured couverture dark chocolate and dusted in Belgium coco powder. This limited edition hand-packaged delight may have you developing a devotion bordering an obsession! Duck Creek Macadamias is the boutique macadamia specialist with an innovative approach to delicious small indulgences. All macadamia nuts used in Duck Creek’s gourmet products are grown on their own plantations scattered across the sub tropical hinterland surrounding Byron Bay. Macadamias, native to this part of Australia, are considered the world’s finest nut. Their great flavour, versatility and crunchy texture make them a delight to eat – this uniqueness has solidified Duck Creek’s award-winning reputation. Duck Creek have won a multitude of Australian gourmet snack awards at the prestigious Sydney Royal Show and have also attracted the attention of Qantas Airlines and Channel Ten's popular show Masterchef, Live in Sydney. All Duck Creek’s products are hand-packaged in a variety of gift jars, snack packs, seasonal gift boxes and wrappings – ideal for any occasion. ‘Orange Obsessions’ come in a variety of ways – Limited Edition Jar: RRP $19.50 (230g); Small Jar: RRP $14.20 (230g); Large Jar: RRP $28.65 (500g). Snacking on Duck Creek Macadamias has never been more indulgent. Available in NSW gourmet food stores Australia wide & online www.duck-creek.com.